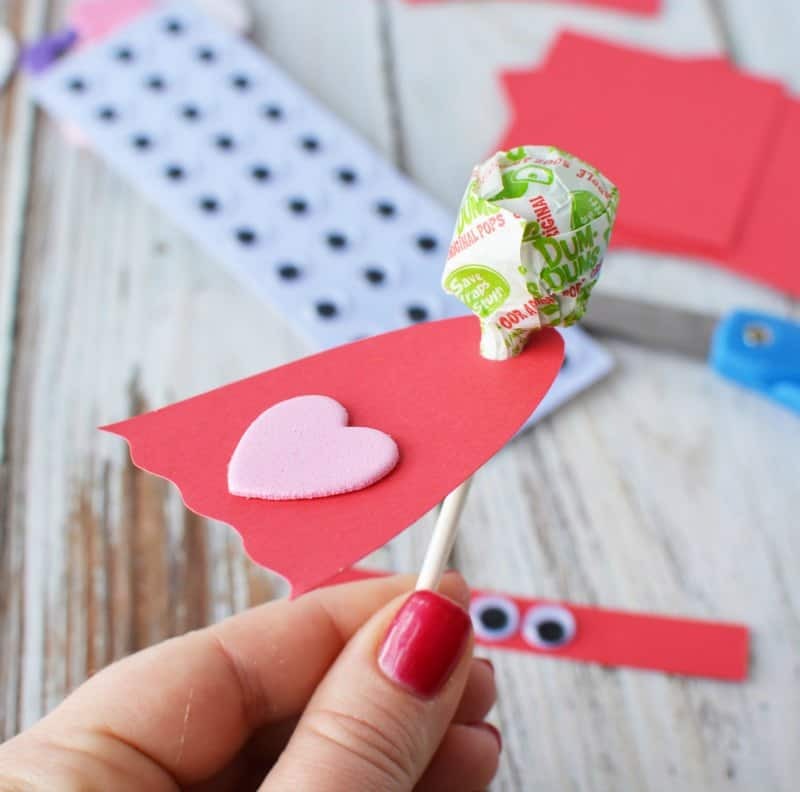 Lollipop superhero valentines day cards are made out of Dum Dum lollipops, construction paper, and googly eyes! 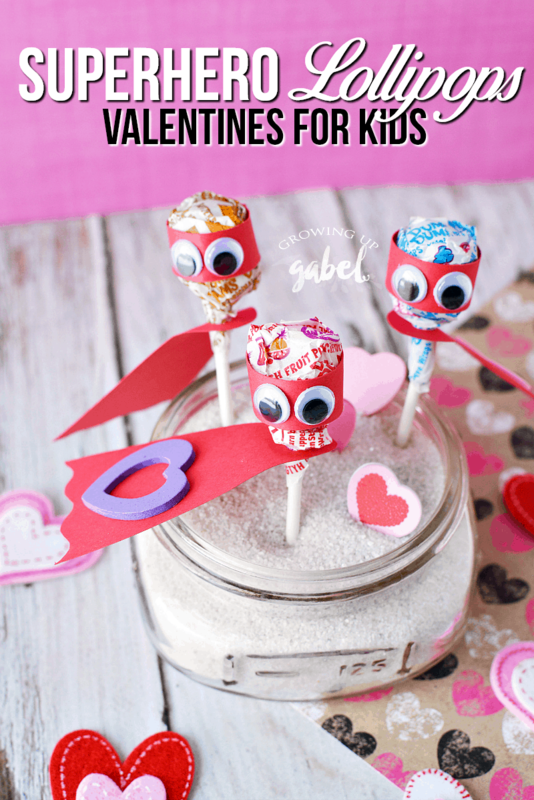 Perfect for Valentines Day parties for kids! Classroom Valentines sure have changed since I was a kid! I remember heading down to the local drugstore to sort through the aisle of boxed Valentines. Then I'd spend a good couple of days picking out just the right one for each classmate. 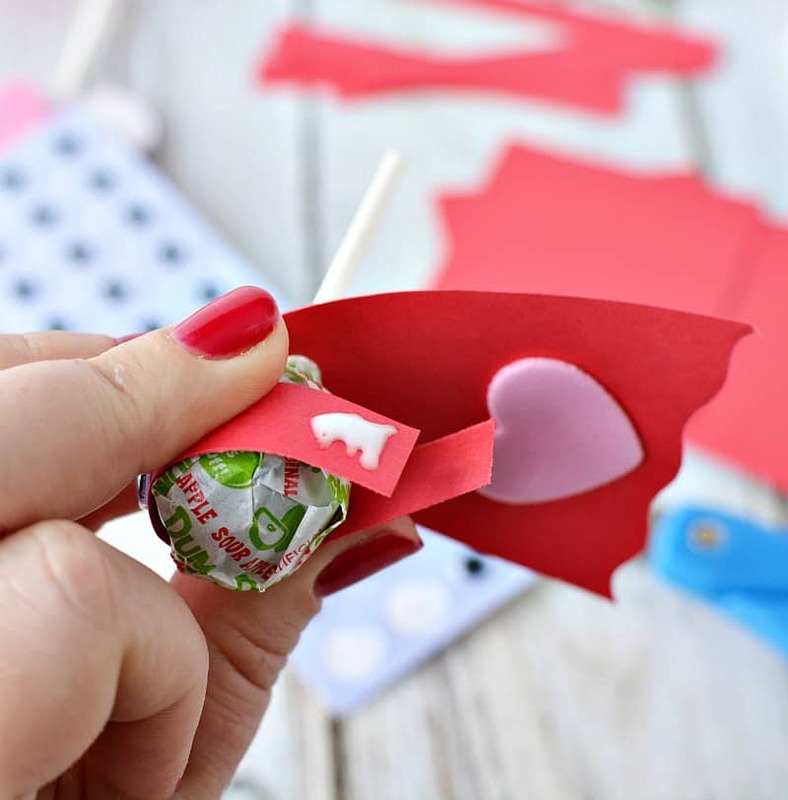 Fast forward 20 years and my kids LOVE putting together little crafty Valentines for their classmates (thank you, Pinterest). And they don't put any names on the Valentines. Everyone just gets one. Things changed and I'll run with it. 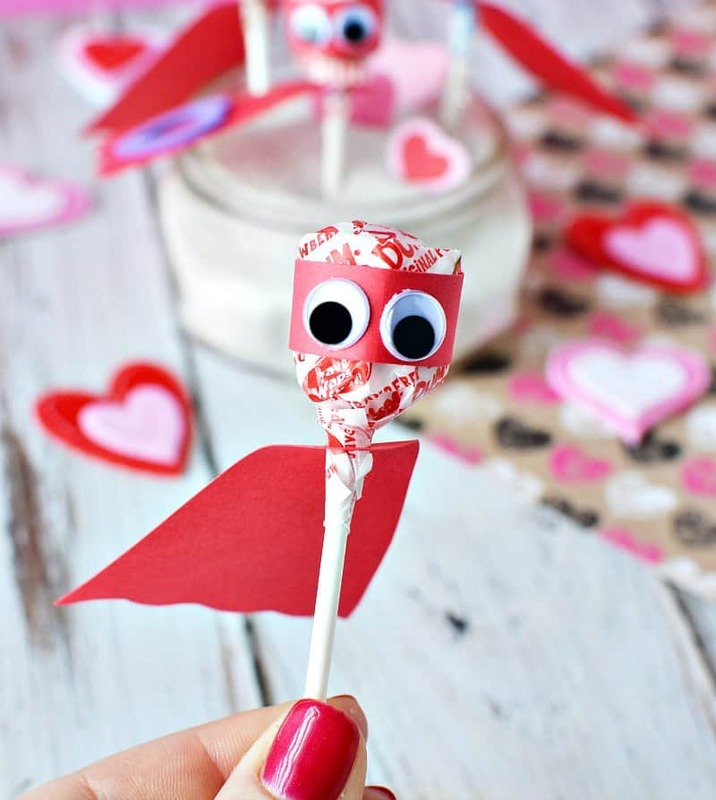 So we have this really cute and easy to make superhero Valentines. 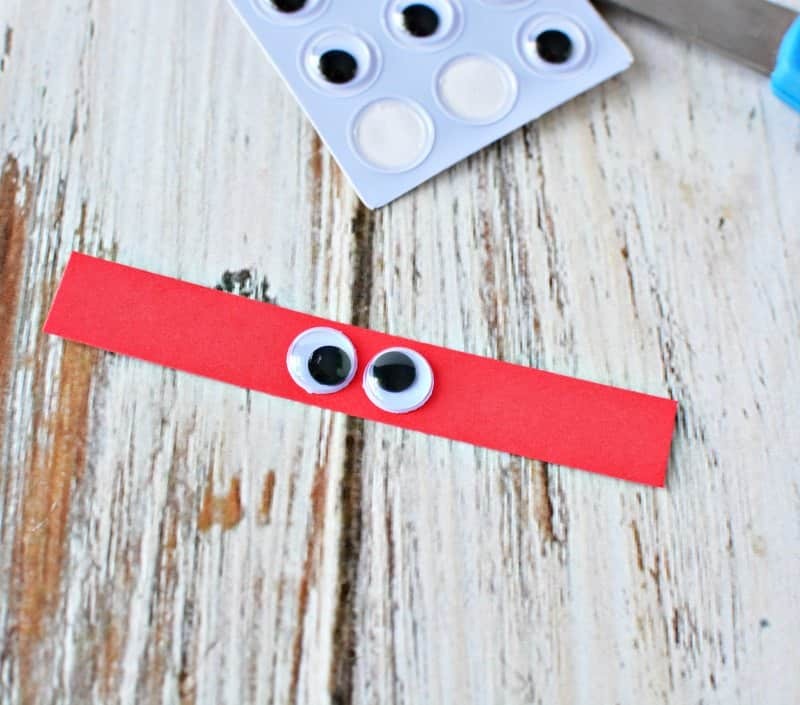 They are easy for your kids to make on their own or put together once you've cut everything out. And you probably already have most of the materials you need in your craft bin. 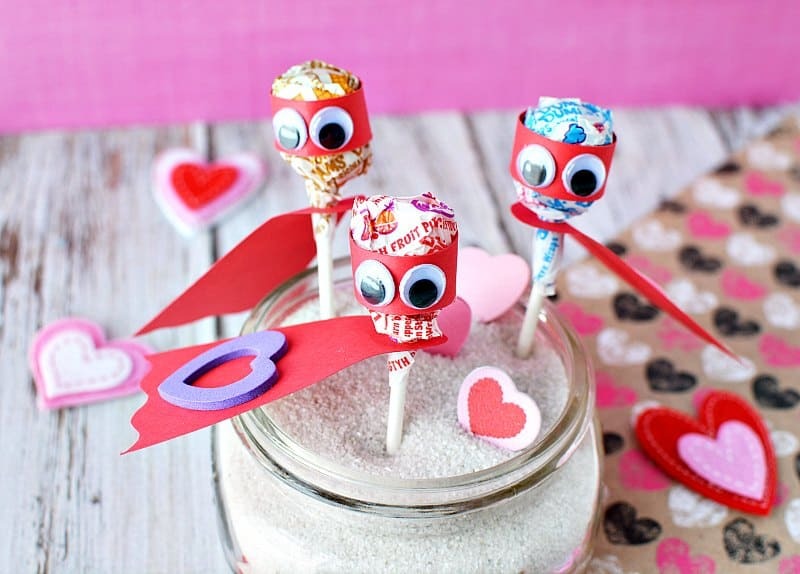 Start by making one cape for each lollipop. 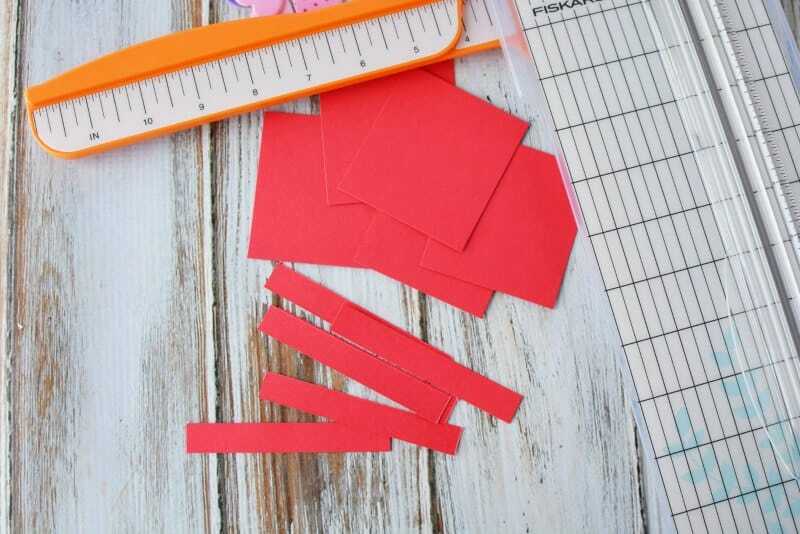 Use the paper trimmer to cut a piece of construction paper into 2.5″ x 2.75″ rectangles. Make this go faster by cutting a few pieces at the same time, if the trimmer is big enough for it. Or cut one as a template and let the kids trace and cut out, too. 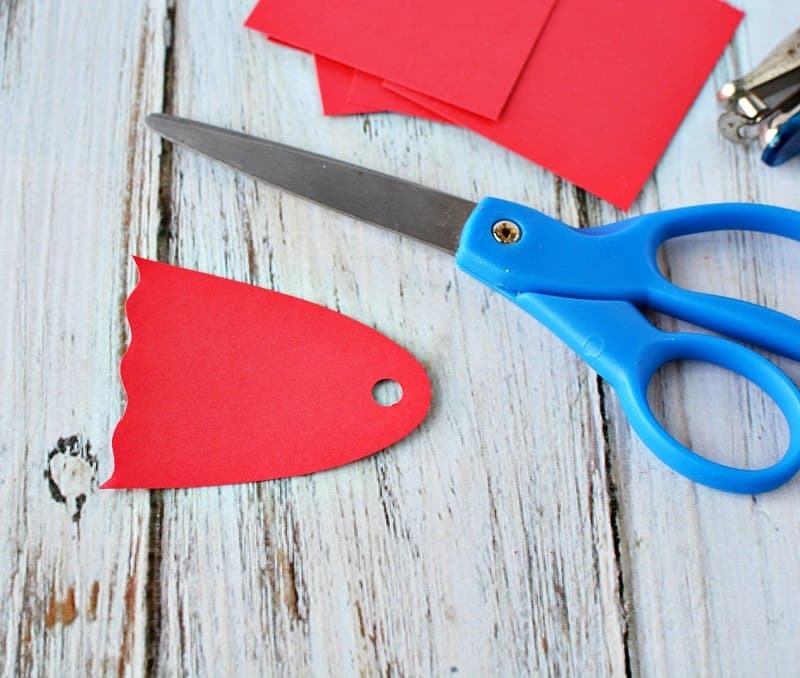 Cut a half oval out of the rectangle with scissors. Again, you can stack these to make the process faster if making a lot. Add a wave to the straight edge to make the cape using scissors. Punch one hole into the opposite end narrow end of the cape. 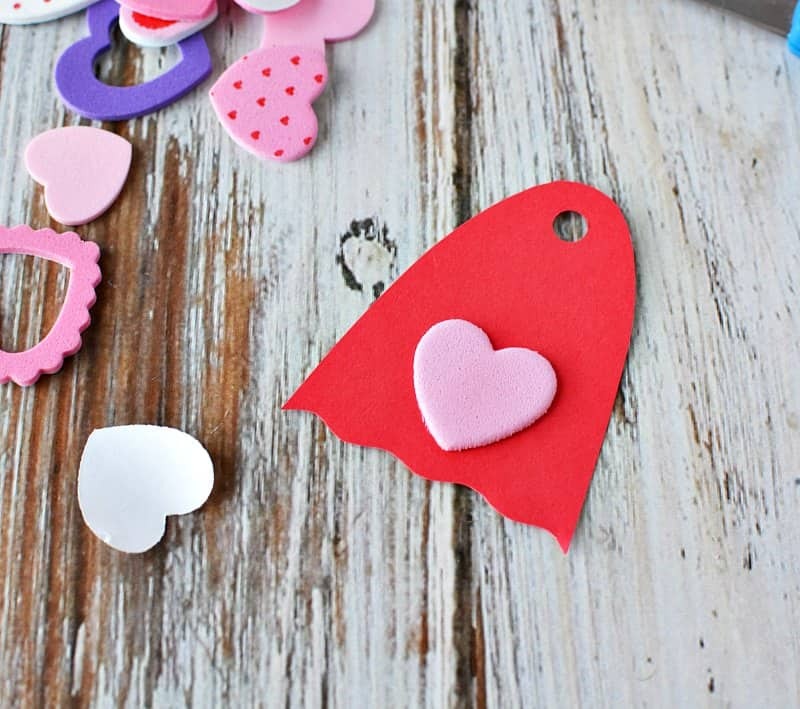 Decorate with foam heart stickers. You could also Valentines Day stickers; glitter glue; or whatever the kids want to use. This a great way to use up a lot of old stuff in the craft bins. Or is that just my bins? Once all the capes are made, each lollipop also needs a mask. 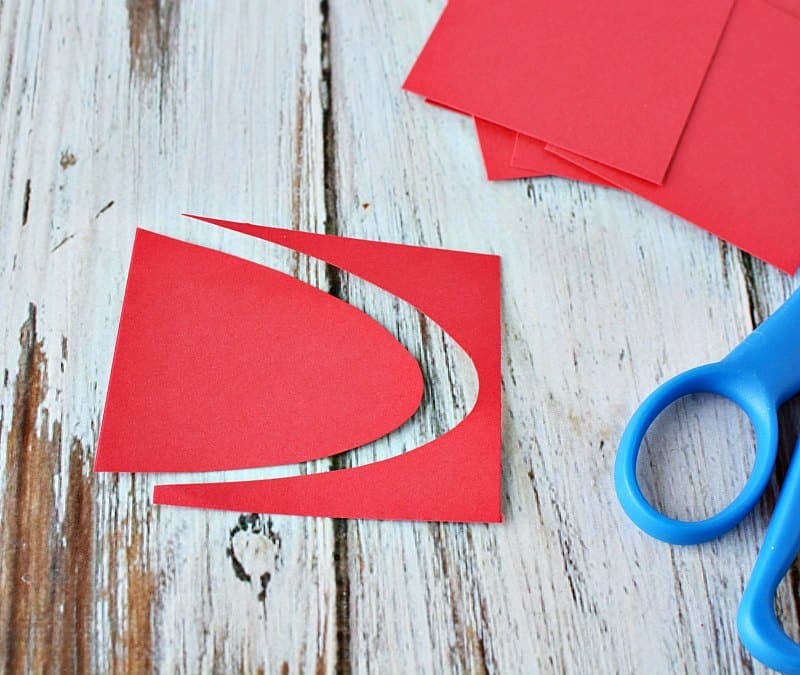 For the mask, cut a piece of card stock 3.5″ x 1/2″ using the paper trimmer. Again, cut one to use as a template and let the kids help. Add 2 googly eyes to each mask. Now it's time to assemble your superheroes. 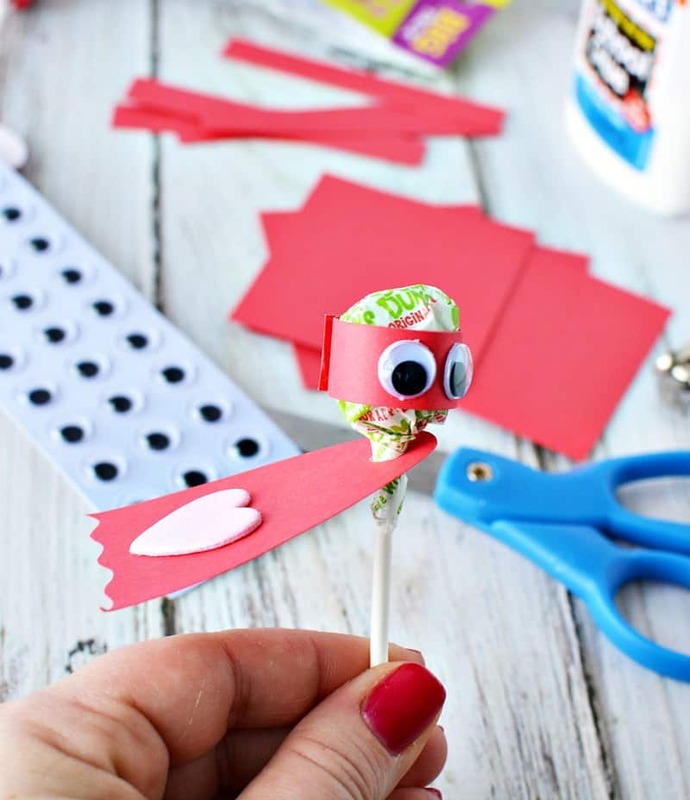 Slide a cape onto each lollipop (or sucker depending where you live) and gently fold downward to create a cape. 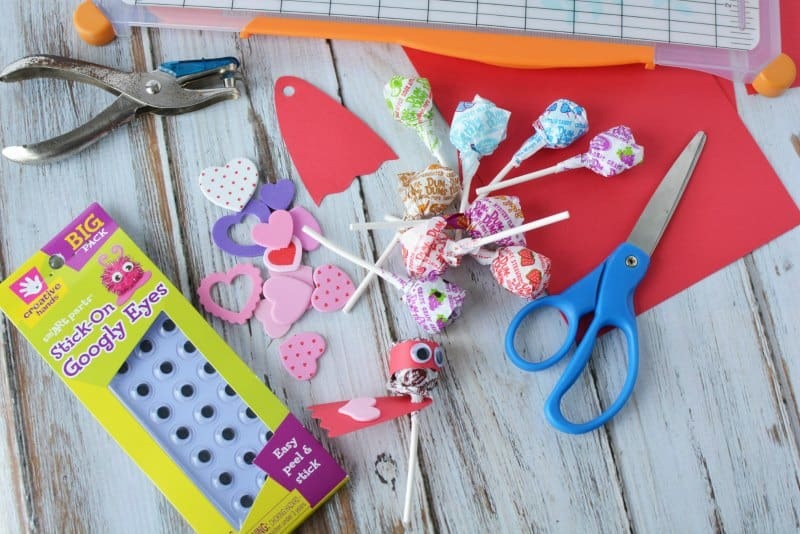 Next, wrap a mask around each lollipop and attach with white glue or Glue Dots. If using glue then old for a few seconds for glue to set. That's it! Your superhero lollipop is ready to go. Hand out at parties or you can place them in a jar filled with a little sand for a cute Valentine's Day decoration or centerpiece.